Soft and chewy on the inside with a crisp, golden brown crust, this Original Bagel 4.5 oz. 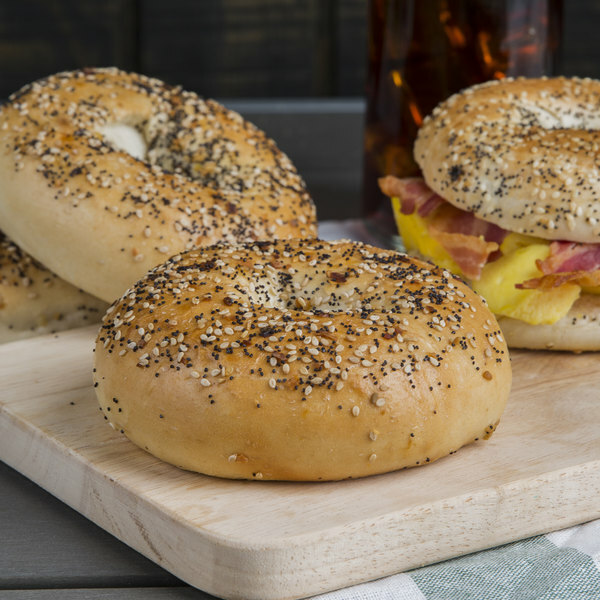 everything bagel is the perfect addition to your breakfast menu! 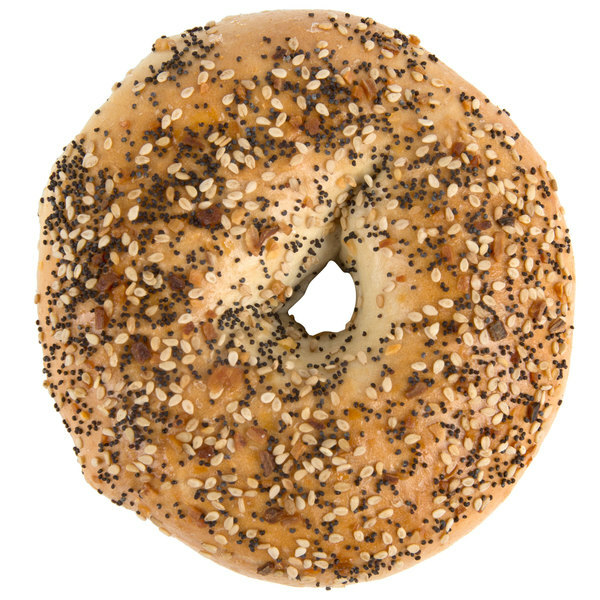 Coated with an "everything" seasoning blend of sesame seeds, poppy seeds, onion, garlic, and salt, this bagel is a classic favorite that's sure to delight your guests. Whether it's spread with your customers' favorite condiments for an open-faced snack or piled high with traditional sandwich fixings, this bagel is a versatile base to a variety of toppings. Topped with a fried egg and smashed avocado or served as a classic bacon, egg, and cheese sandwich, this bagel provides a flavor-packed breakfast option for your restaurant, diner, or coffee shop. It can also be layered with smoky bacon, lettuce, and fresh tomato slices for a delicious spin on a BLT sandwich. Made from scratch with premium ingredients, this bagel is par-baked and frozen to preserve its freshness. Prior to baking, the dough is given a 12-hour fermentation period, giving it ample time to develop the best possible flavor. The bagel is then kettle boiled and hearth baked to provide the authentic, New York style taste your guests know and love. To heat, simply place the frozen bagel on a sheet pan and bake at 400 degrees Fahrenheit for 9 minutes, let it sit for 20 minutes, and serve! Since it's easy to prepare, this bagel helps save you valuable time in the kitchen and minimizes your guests' wait time without sacrificing on quality or flavor. Your customers are sure to love the freshly baked taste of this everything bagel! 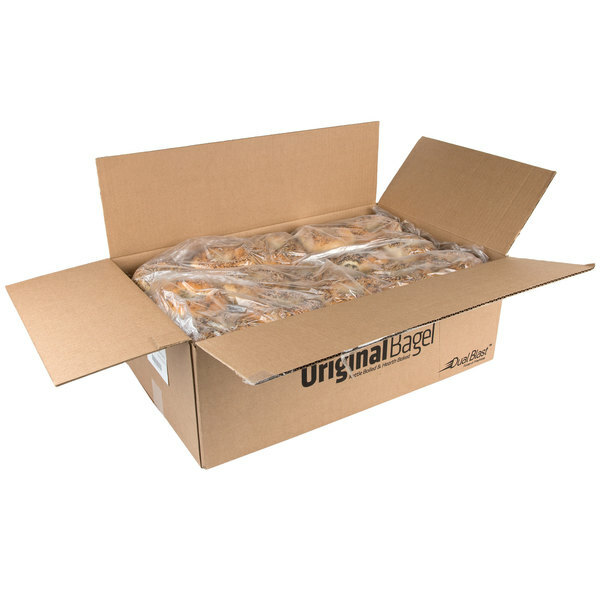 With humble beginnings in 1995, Original Bagel started its journey as a tiny Rhode Island bakery with a makeshift "proof box" to provide fresh bagels to local bake shops and delis. The company quickly expanded into a large, from-scratch operation in New Jersey and has since become a leader in creating authentic kettle boiled, hearth baked bagels. Their success can be attributed to a combination of custom machinery, modern processes, and a team of bagel-baking experts, allowing them to produce over 2 million bagels per week while still maintaining an emphasis on quality control and premium ingredients. 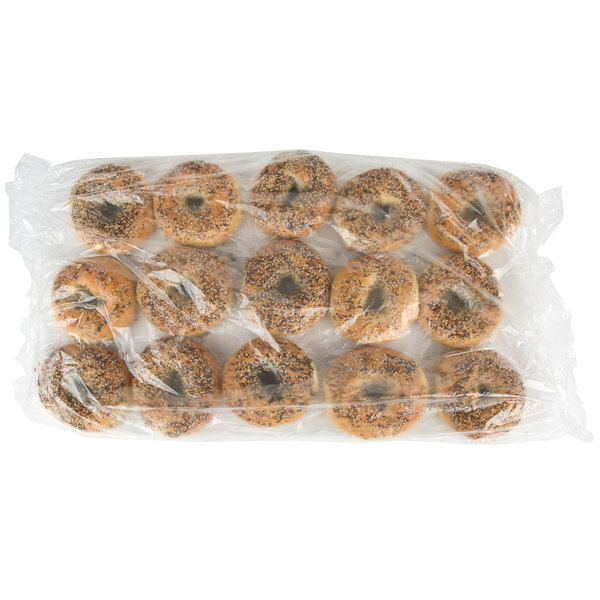 Plus, they are continually working to reduce their environmental impact and remain actively involved in the community, making Original Bagel a name customers can trust. Bring the unmistakable taste and craveable texture of a classic New York style bagel to your guests with the help of Original Bagel!